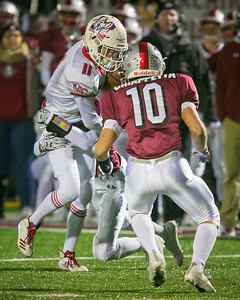 Daryl Quitalig - For Shaw Media Marian Central Catholic defensive back Cam Interrante (14) tackles Antioch quarterback Branden Gallimore (1) in the second quarter of an IHSA Playoff Class 5A football game at Antioch High School Friday, Oct. 27, 2017. The Hurricanes won, 31-9. 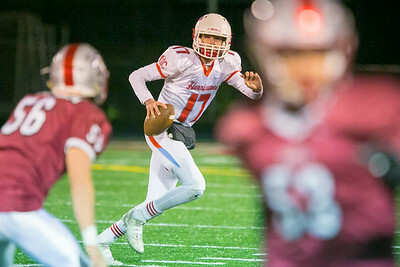 Daryl Quitalig - For Shaw Media Marian Central Catholic quarterback AJ Golembiewski (17) scrambles while looking for a pass in the fourth quarter of an IHSA Playoff Class 5A football game at Antioch High School Friday, Oct. 27, 2017. The Hurricanes won, 31-9. 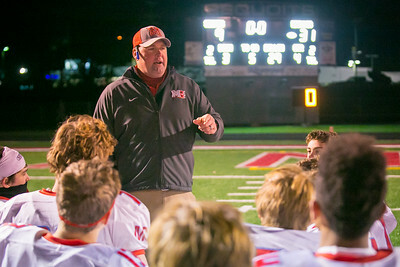 Daryl Quitalig - For Shaw Media Marian Central Catholic head coach Mike Maloney speaks to his team after the 31-9 victory over Antioch in an IHSA Playoff Class 5A football game at Antioch High School Friday, Oct. 27, 2017. 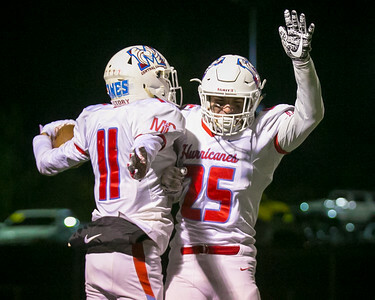 Daryl Quitalig - For Shaw Media Marian Central Catholic's Bryce Radcliffe (11) and Charlie Kramer (25) celebrate a touchdown in the fourth quarter of an IHSA Playoff Class 5A football game at Antioch High School Friday, Oct. 27, 2017. The Hurricanes won, 31-9. 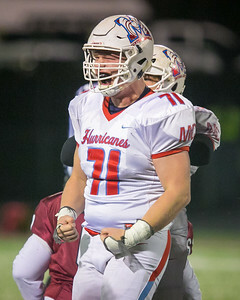 Daryl Quitalig - For Shaw Media Marian Central Catholic Thor Paglialong (71) celebrates after a tackle in the third quarter of an IHSA Playoff Class 5A football game at Antioch High School Friday, Oct. 27, 2017. The Hurricanes won, 31-9. 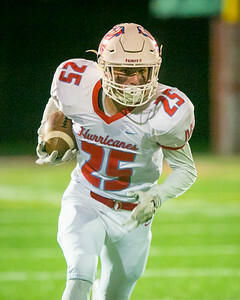 Daryl Quitalig - For Shaw Media Marian Central Catholic receiver Charlie Kramer (25) runs the ball in the first quarter of an IHSA Playoff Class 5A football game at Antioch High School Friday, Oct. 27, 2017. The Hurricanes won, 31-9. 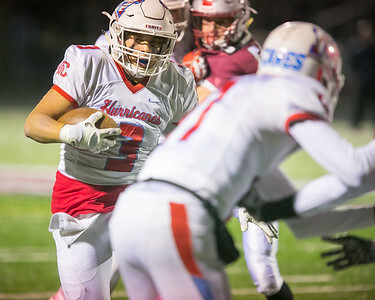 Daryl Quitalig - For Shaw Media Marian Central Catholic reciever Bryce Radcliffe (11) runs the ball in the first quarter of an IHSA Playoff Class 5A football game at Antioch High School Friday, Oct. 27, 2017. The Hurricanes won, 31-9. 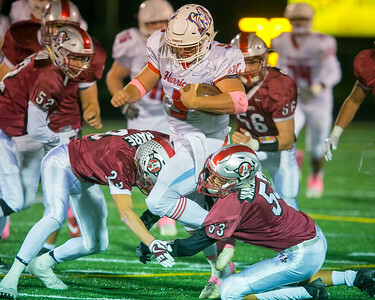 Daryl Quitalig - For Shaw Media Marian Central Catholic quarterback Pasquale Ricciardi (3) runs the ball in the fourth quarter of an IHSA Playoff Class 5A football game at Antioch High School Friday, Oct. 27, 2017. The Hurricanes won, 31-9. 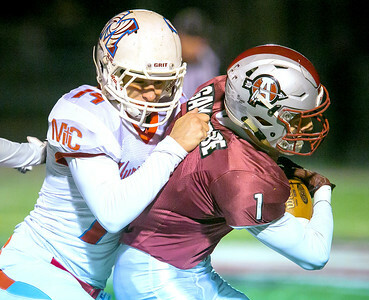 Daryl Quitalig - For Shaw Media Antioch quarterback Branden Gallimore (1) runs the ball as he's tackled by Marian Central Catholic defensive end Sam Limbaugh (4) in the fourth quarter of an IHSA Playoff Class 5A football game at Antioch High School Friday, Oct. 27, 2017. The Hurricanes won, 31-9. 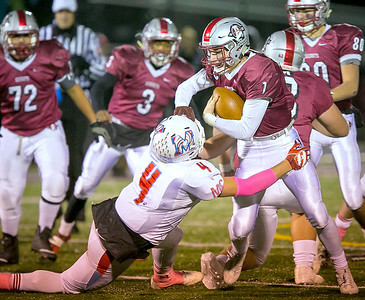 Daryl Quitalig - For Shaw Media Marian Central Catholic quarterback Gavin Scott (5) runs the ball in the fourth quarter of an IHSA Playoff Class 5A football game at Antioch High School Friday, Oct. 27, 2017. The Hurricanes won, 31-9. 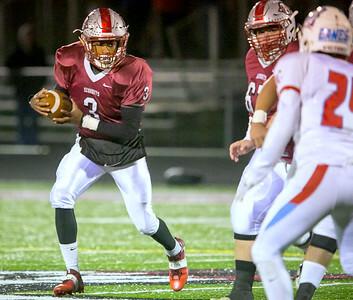 Daryl Quitalig - For Shaw Media Antioch running back Drew Porter (3) runs the ball in the third quarter of an IHSA Playoff Class 5A football game at Antioch High School Friday, Oct. 27, 2017. The Hurricanes won, 31-9. 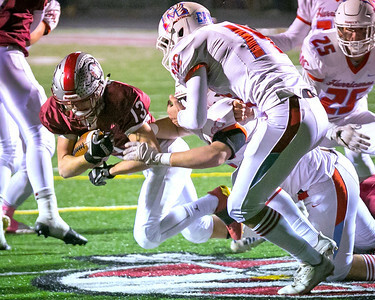 Daryl Quitalig - For Shaw Media Antioch running back Hunter Price (13) runs the ball in the third quarter of an IHSA Playoff Class 5A football game at Antioch High School Friday, Oct. 27, 2017. The Hurricanes won, 31-9.